Yoga Injuries: When Do They Happen? What are the contexts for yoga injuries? 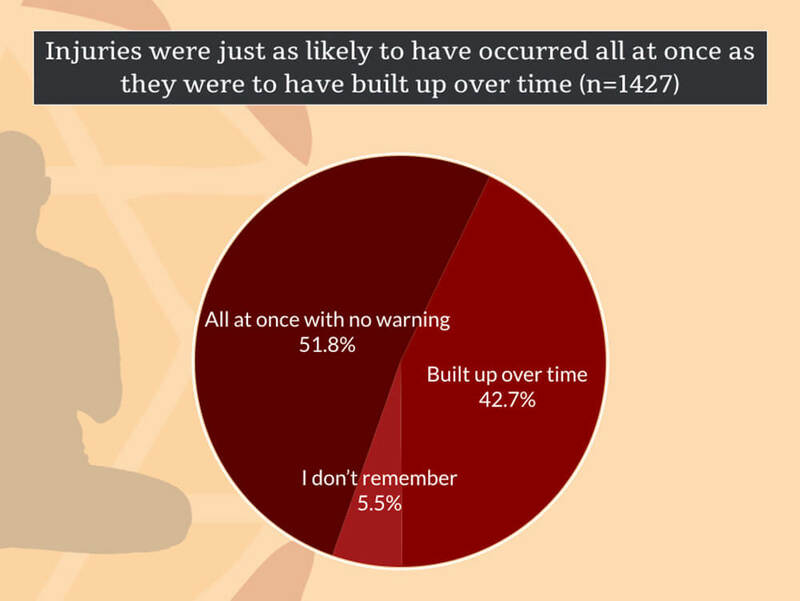 We’ve now summarized many of the results from our survey project for you. We’ve discussed the negative experiences in yoga, context of specific yoga injuries and injuries to specific areas of the body. But what about “injury” in general? 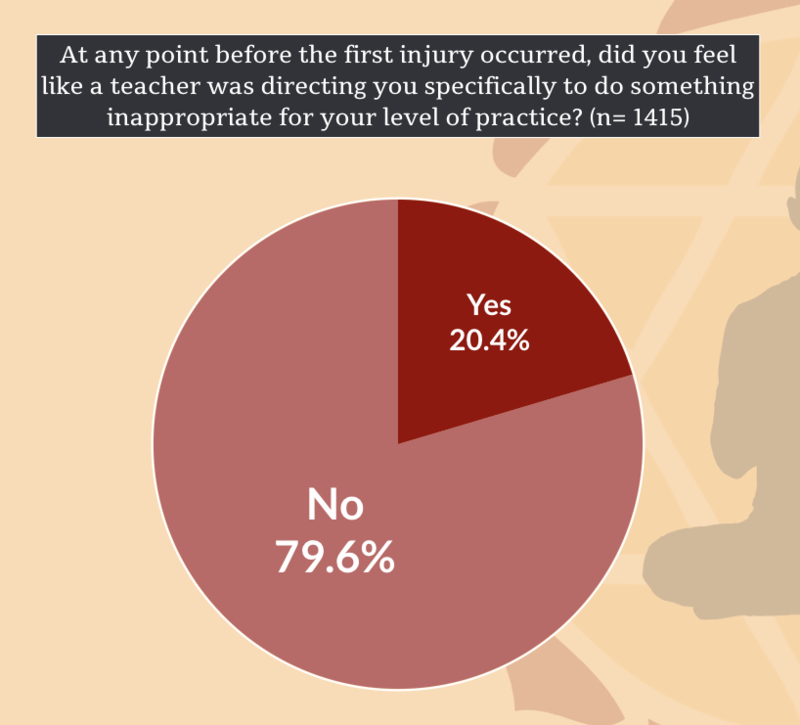 Are there common contexts for experiencing an injury at all in yoga? Can we avoid ever experiencing an injury in yoga? I think it is important for us as a yoga community to start asking better questions about what we are intending to use yoga asana for and how much risk we are willing to accept in that process. Yoga asana is physical movement. There is inherent risk in physical movement. Hands up for everyone who has stubbed a toe, skinned a knee, or worse from merely tripping on the sidewalk!?! A better question is where is there more or less risk for injury in yoga? 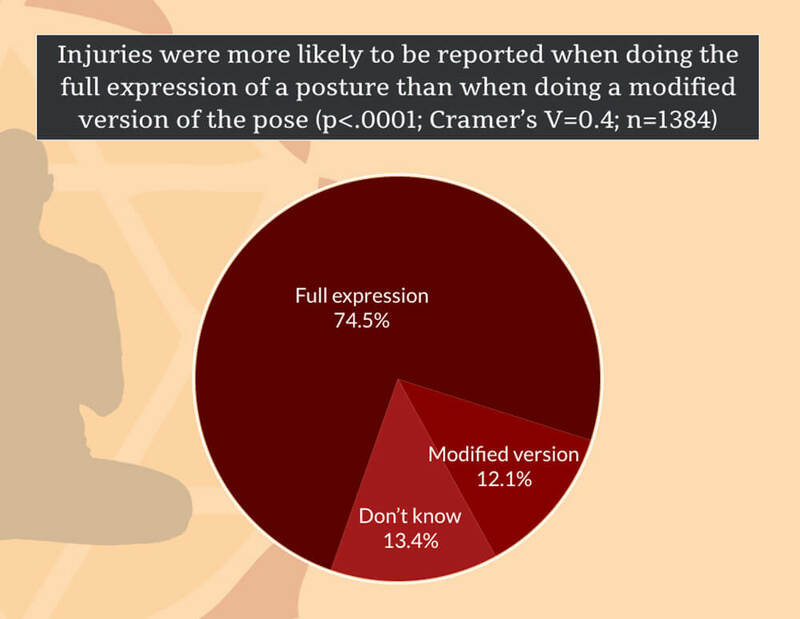 Is there more or less risk in certain postures or sequences? 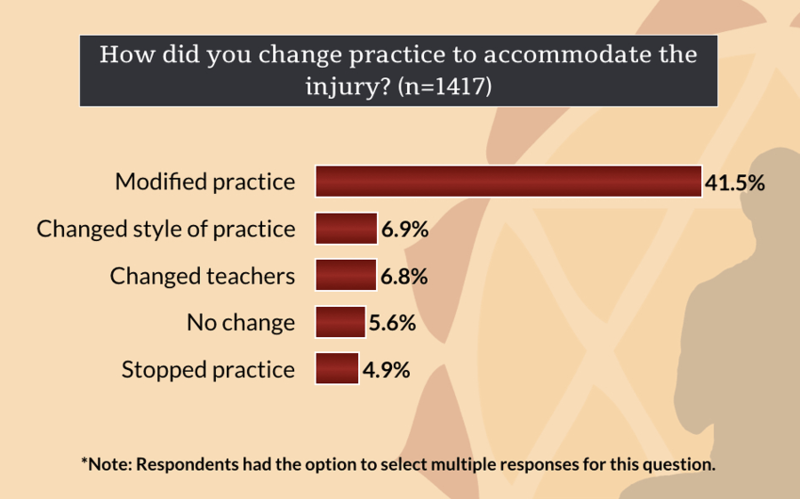 Are there contexts of practice in which risk of injury is greater or lesser? 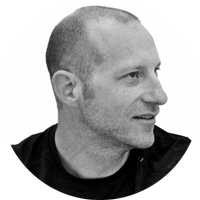 The answers to these kinds of questions empower us as asana practitioners to make more informed choices about what kind of asana practice suits us. 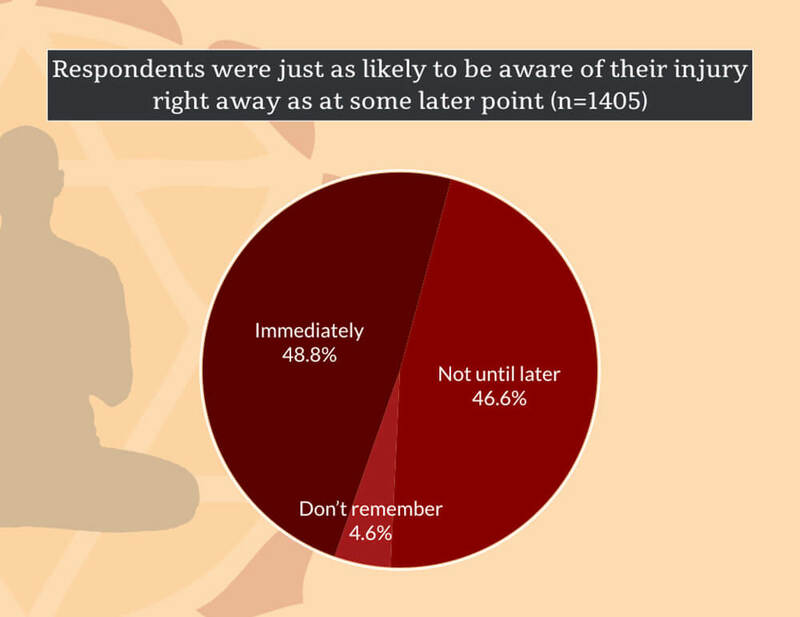 It gives us information about ways and contexts in which we could potentially reduce the risk for yoga injuries, while still doing the practices that we find most beneficial for our particular use. 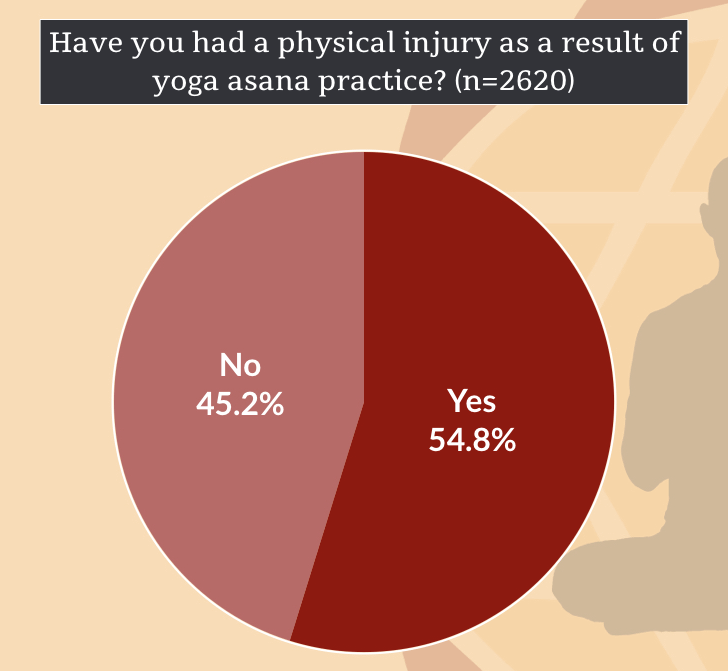 You’ll remember that about half (54.8%) of our survey respondents (n=2620) reported yes, when asked specifically if they had had at least one physical injury as a result of yoga asana practice during the lifetime of their practice. 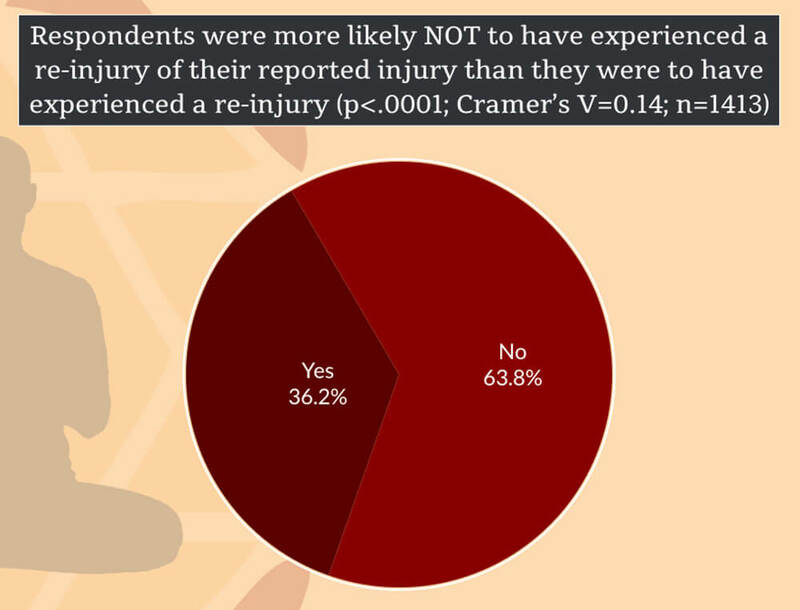 Those that responded “yes, they had experienced at least one injury” were asked a series of additional questions regarding the context of their injury. 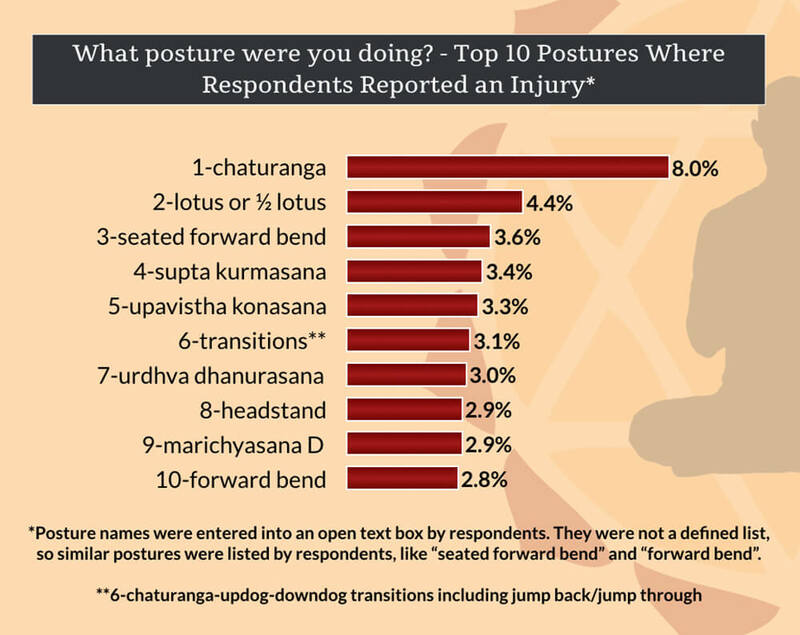 In this post we’ll summarize that context for you and then discuss which factors seem to be the strongest driving factors for yoga injuries based on our statistical analysis. In order to explain how we arrived at the results we want to share with you, we’ll give a quick overview of the statistical tests that we used. A full explanation of how these tests work is well beyond a single blog post. Our intention here is only to name the tests used and what kind of relationship between variables they are used to describe, so you have a general understanding of how the results were generated. For the analyses reported in this post, we used the chi-square test of independence to evaluate whether each of the two variables of interest were independent from each other (not related) or were related in some way. If the resulting “p-value” is less than 0.01, then there is a less than 1% probability that the variables are unrelated or you could say there is a more than 99% probability that the variables are related. We would then say there is a statistically significant relationship between the two variables. 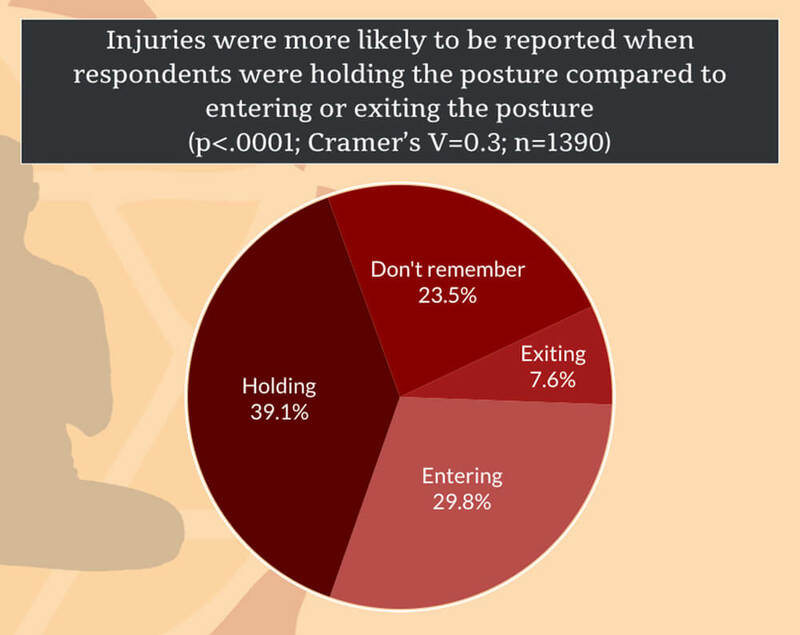 The chi-square test of independence allows us to explore whether individual practice contexts are related to likelihood of reporting injury in yoga. We also report the “effect size” of the relationship between the two variables. Effect size describes the strength of the association between the two related variables. For example, we might say that two related variables have a weak, moderate, or strong relationship to one another. This is noted as Cramer’s V=some number. 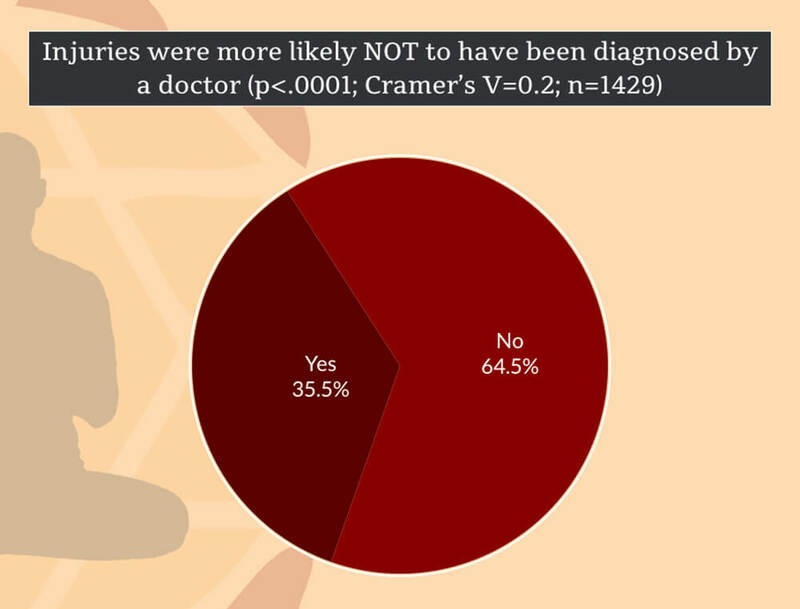 We say there is a small/weak association when Cramer’s V is between 0.1 and 0.2, a moderate association when Cramer’s V is between 0.3 and 0.4, and a strong association when Cramer’s V is equal to 0.5 or greater. Let’s get started with the results! 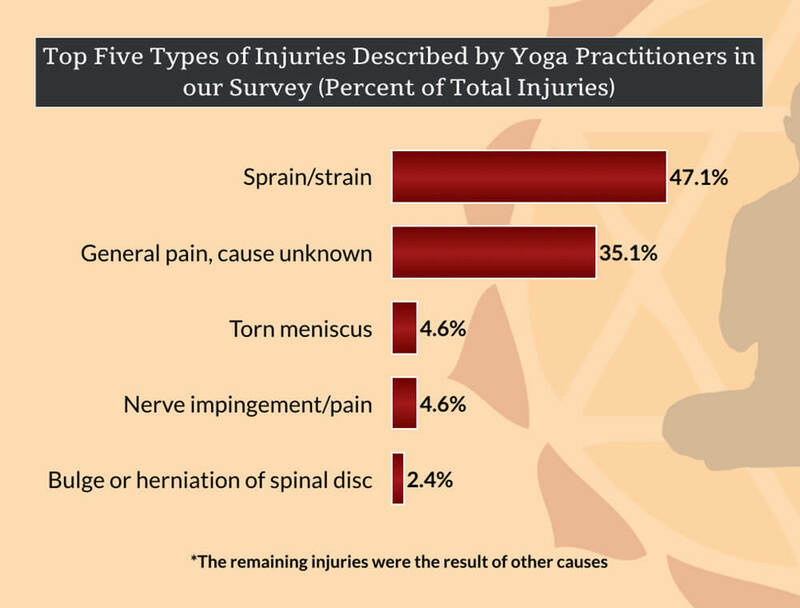 Below you’ll find a series of graphics summarizing the context of yoga injuries reported by our survey respondents. 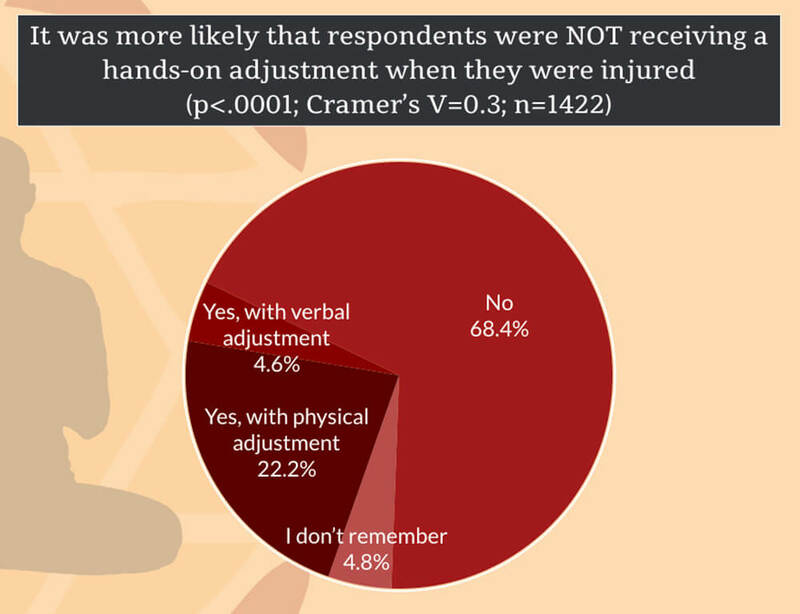 Mild injuries: Practitioner recovered in 6 weeks or less, did not feel pain outside of practice, and did not see a doctor for a medical procedure. 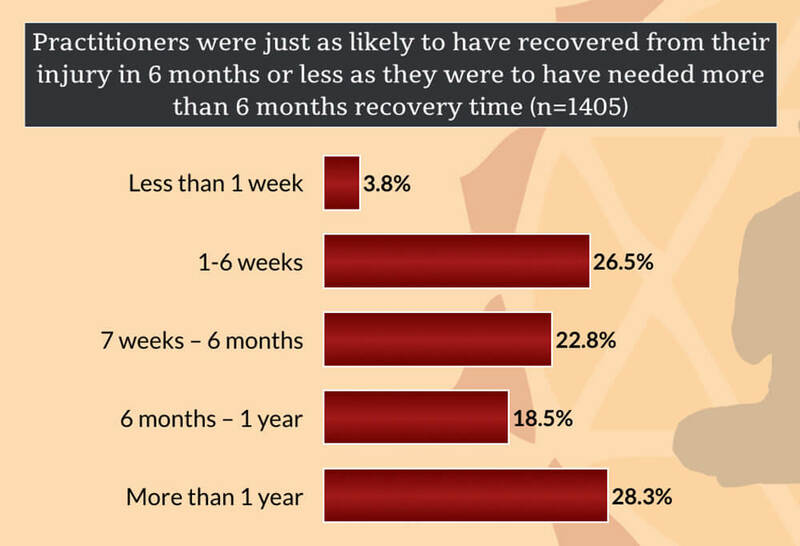 Moderate injuries: Recovery time from the injury was greater than 6 weeks, but less than 1 year and/or the practitioner felt pain from the injury outside of practice. The practitioner did not see a doctor for a medical procedure. Severe injuries: The practitioner saw a doctor for a medical procedure related to the injury and/or recovery time was more than 1 year. fell out of a pose and was injured in the fall or tripped/stubbed toe, etc. 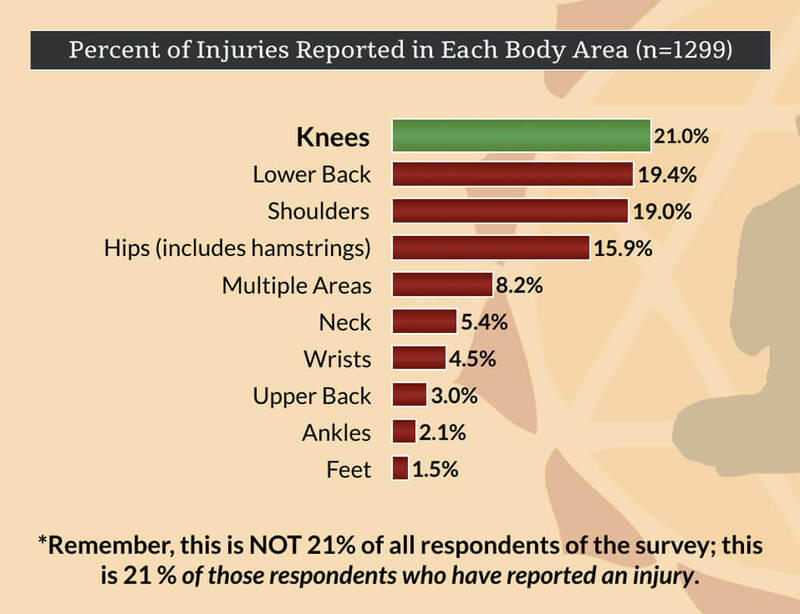 All of this data gives some context to the situations where injuries might occur in yoga. 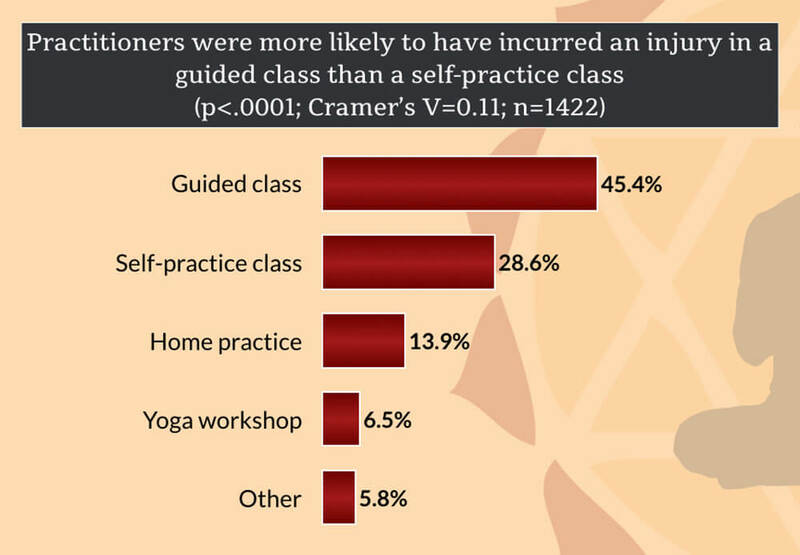 One thing to note is that practitioners reported all kinds of reasons that they got hurt while doing yoga. We can’t blame just one thing and individual factors in yoga practice situations don’t happen in isolation. For example, our level of fatigue interacts with our comfort with a particular posture and how much that posture takes us to our edge. Stay tuned for part two of this discussion where we report the results of our analysis that considers all the contextual factors of yoga practice together. Does Frequency Of Yoga Practice Matter? 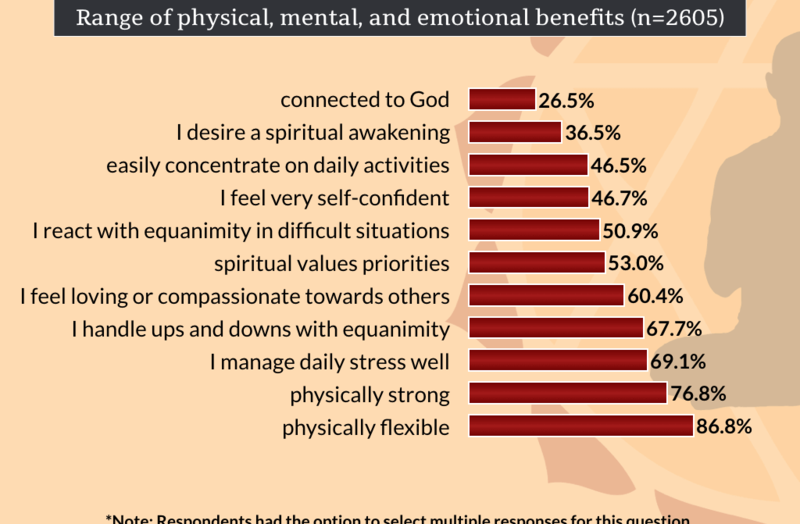 Based on our survey of over 2000 yoga practitioners, David shares that doing a yoga practice at least 5 days per week increased the benefits of practice. 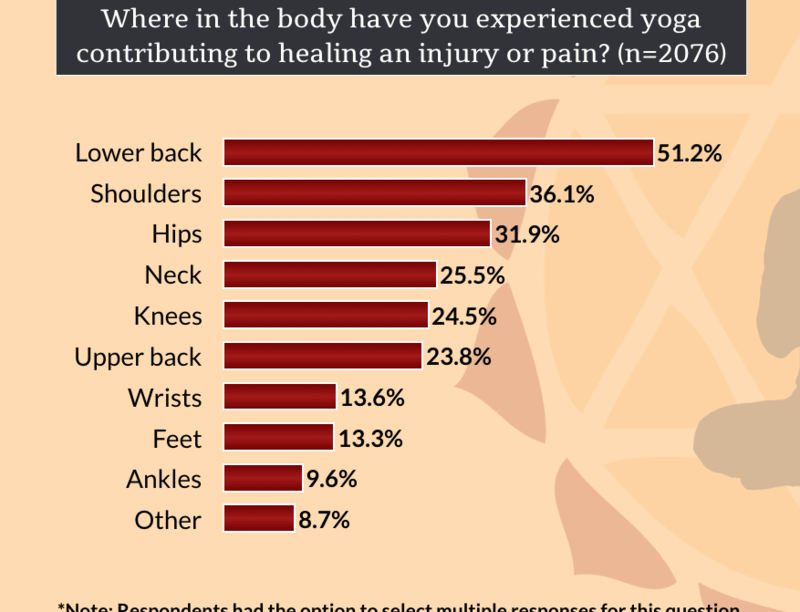 Based on our survey of over 2000 yoga practitioners, David shares practitioners’ experiences of contexts in which yoga contributed to healing from a pain or injury. 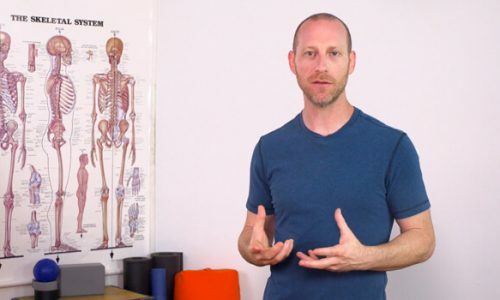 In this article, David sums up the conversation on injury in yoga. He suggests a new conversation that empowers yoga practitioners and teachers to make informed decisions on yoga and risk.